Maiden’s Tower, or Kiz Kulesi, is an ancient site in Istanbul located on a tiny islet in the Bosphorus Strait that has a history of both practicality and folklore. The origins of the tower aren’t completely known, leading to legends such as one attesting that it was built to lock away a princess after it was prophesized she would die from a snake bite on her 18th birthday – hence the name Maiden’s Tower. The origin of Maiden’s Tower is believed to date back over 2,000 years, though the tower itself has changed over the centuries. Originally built of stone, a wooden tower was added in the 12th century after the Ottoman Turks conquered the area. This led to the tower’s downfall when a fire ravaged it in the 1700s. The tower was rebuilt in stone and in the 1800s a light was also added to the top. During this time, Maiden’s Tower also switched from being used as a defense tower to being intermittently used as a lighthouse and as a quarantine facility for those affected with cholera. Today, Maiden’s Tower is home to an upscale restaurant and bar. The bar is located on the top floor and has a romantic vibe with an outdoor balcony you can enjoy your drink on. Due to its location, the only way to visit Maiden’s Tower is via water and boats frequently leave for the tower from Kabatas (western side) and Uskudar (eastern side). The boat ride generally takes less than 20 minutes. Dine in style as you cruise past illuminated city landmarks like Dolmabahçe Palace and the Fatih Sultan Mehmet Bridge on this 3.5-hour evening cruise along the Bosphorus. Sample typical Turkish cuisine , then settle back to enjoy some traditional entertainment, including belly dancing and folk music.Start your evening with pick up from your hotel before heading to the port to embark on our 3.5-hour evening Bosphorus cruise from Istanbul. Watch the sun set over the Bosphorus Strait and cruise. After dinner marvel at Turkish belly dancers during an Anatolian folklore show. After your boat docks, your experience finishes with drop off at your Istanbul hotel. 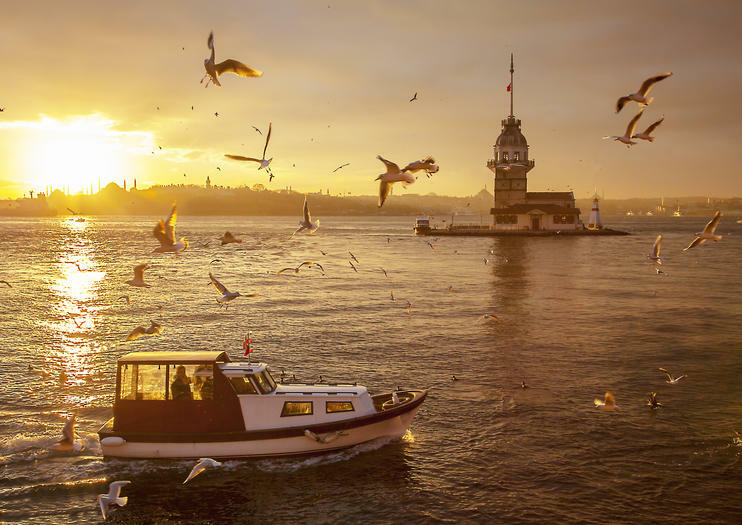 Witness the beauty of Istanbul at dusk on this 1.5-hour evening sightseeing cruise and watch the sunset over both the European and Asian sides. The on board loud speaker will highlight all the sights as you sail past, so keep a look out for Topkapi Palace, Maiden's Tower, Ortaköy & Mecidiye Mosque, Dolmabahce Palace, the Bosphorus Bridge and Cıragan Palace. Discover a different side to Istanbul as you escape the tourist trail and explore the Üsküdar district on the city’s Asian side. This 3.5-hour tour takes in lesser-known attractions and dramatic viewpoints like Camlica Hill, Istanbul’s highest point, and the Maiden Tower, where you can enjoy a coffee overlooking the Bosphorus. Immerse yourself in Istanbul’s historic streets and endless waterfront sights on a full-day tour of the city and the Bosphorus Strait. Trace a ‘best-of’ route from the soaring Bosphorus Bridge to panoramic viewpoints, a luxurious Ottoman palace, shopping districts and a beloved local restaurant. Leave the shore behind for a cruise along the European and Asian sides of the city, where you’ll enjoy perfect views of elegant villas, palaces and fortifications, then get an insider’s introduction to one of Istanbul’s most iconic markets. Discover the cultural melting pot of Istanbul on a tour that includes historic marvels, mouth-watering gastronomy and famous landmarks. This private full-day tour visits attractions like Hagia Sophia, the Galata Tower and the Basilica Cistern, taking you on a thrilling journey from Europe to Asia and back again. Along the way, fill up on an array of delicious Turkish delicacies from hearty kebabs to sugary Turkish delights. Learn more about local neighborhood culture, Most iconic attractions of Istanbul on the Asian sideLearn more about the Istanbul’s multicultural background, Have better understanding of Istanbul’s history, A superb opportunity to see Istanbul like a local. See Istanbul from different angles unlike millions of visitors. Bosphorus dinner cruise with ARABIC Show is very unique because you can try and experience another amazing culture in Istanbul which is amazing and full of fun and also you can try Arabic and Syrian food.تعتبر سهرة البسفور المسائية العربية رحلة رائعة جداً لكي تقوم بها داخل اسطنبول لما يوجد بها من عروض مسلية وجميلة وايضاً طعام رائع يمكنك تجربته كما انها تعتبر مناسبة اكثر للعائلات الكبيرة والأطفال حيث يشاهدوا بعضاً من الفلكور العربي والسوري والاستمتاع ببعض الفقرات الخاصة بالأطفال ايضاً.